To eat this salad, upend the jar over a bowl and toss to combine. The layers will keep the dressing from getting your green soggy. Keeps 3 – 4 days in the fridge. Tomorrow is Earth Day and you can celebrate by putting together a lunch that’s good for you and the planet. 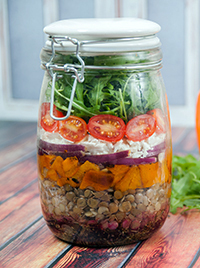 This salad is packed with colorful vegetables and fiber-rich lentils all made to fit in one jar, perfect for the office. A plant-based food system requires less energy, land, and water resources than a typical meat-based system. Plus eating a variety of plant foods can help lower your risk for cancer and other chronic diseases. 55 g carbohydrate, 25 g protein, 17 g dietary fiber, 535 mg sodium. 1/3 cup crumbled reduced-fat feta cheese, about 1½ oz. Set rack near top of oven. Preheat oven to 500 degrees F.
Place pepper halves cut-side down on baking sheet. Roast 30 minutes, or until skins are mostly blackened and blistered. Place peppers in small bowl, cover with plastic wrap and set aside for 20 minutes. Peel peppers and chop them into 3/4-inch pieces. In wide-mouth 1 quart canning jar, combine oil, vinegar, oregano, garlic powder, salt and pepper. Using fork, stir vigorously to combine them. Add beets, arranging them to cover bottom of jar. Add lentils, then chopped roasted pepper. Separate onion into rings and make layer, using as many of them as you like. Arrange feta on top of onions. Place tomato halves in a ring, pressing cut sides against sides of jar, leaving feta uncovered in center. Fill remaining space in jar with arugula. Cover jar tightly. Salad will keep in refrigerator for up to 3 days. To serve, empty contents of jar into large bowl and, using fork, toss to combine.